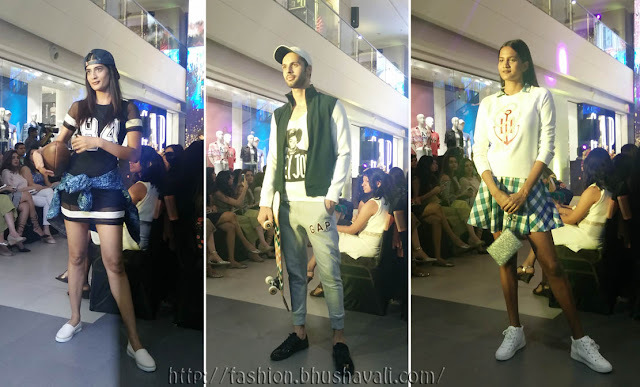 A couple weeks back, Phoenix Market City in Chennai organized a fabulous Fashion Show showcasing the AW16 collection of all the brands that it houses incl GAP, Kenneth Cole, Aldo, Diesel, Tommy Hilfiger, Zara, Swarovski etc. The show was choreographed by the famed Lubna Adams and the show was split into 7 sequences. Organized with an escalator as the ramp, it was one excellent show. Happening in a crowded mall, with a section around the escalator cordoned off, it was excellent crowd & security management to think of it esp. 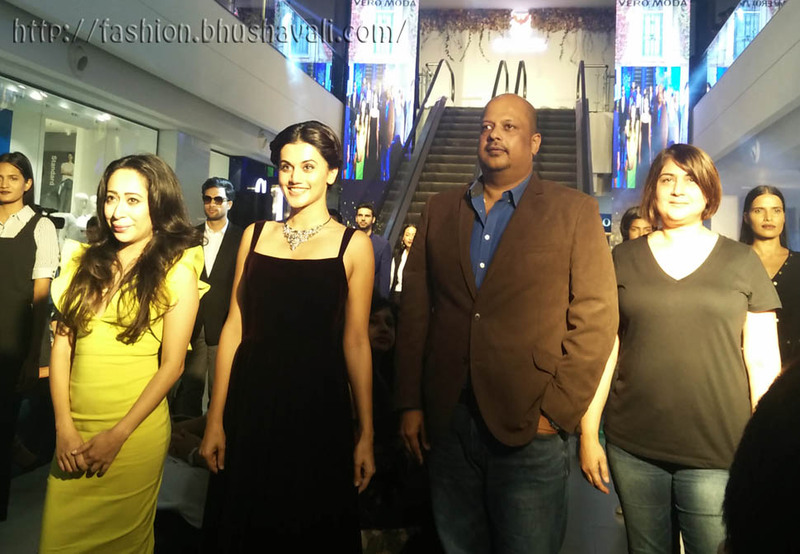 with gorgeous models & spectacular show stopper Tapsee Pannu involved, it isn't easy! Just beyond the blocked area, the Chennai-ites had crowded to catch a glimpse of their fav actress!!! The only trouble was the lighting - the disco lights didn't converge as flood light at the head of the ramp and were too disturbing to even see the outfits properly!!! The first sequence called 'Drama Drama' was my most favourite sequence. 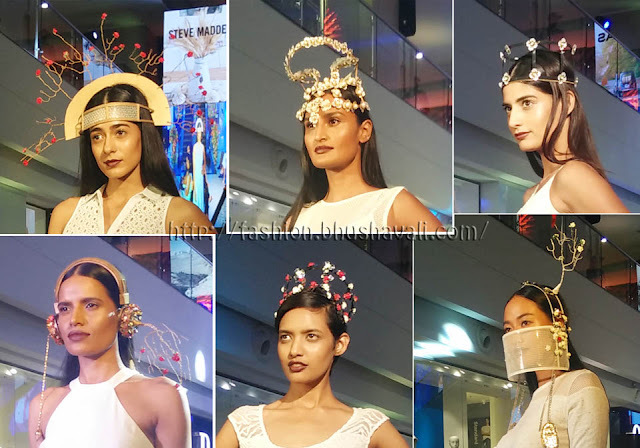 Simple LWDs with exquisite and quirky headgears designed by Manthan Yadav, this was the most creative of it all. 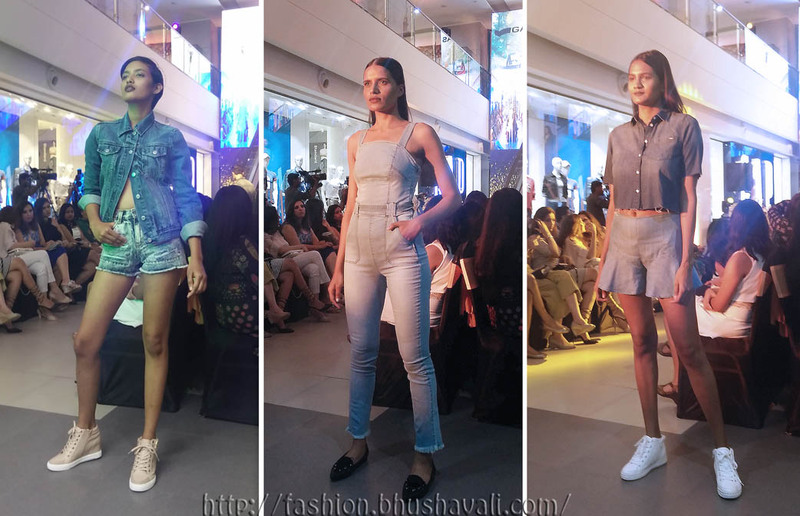 The 2nd sequence was called Denim Affair with assorted washes of denim incl acid wash in assorted garments incl skirts, dungarees etc. It was all tints, tones and shades of blue and there weren't any colored denim here. 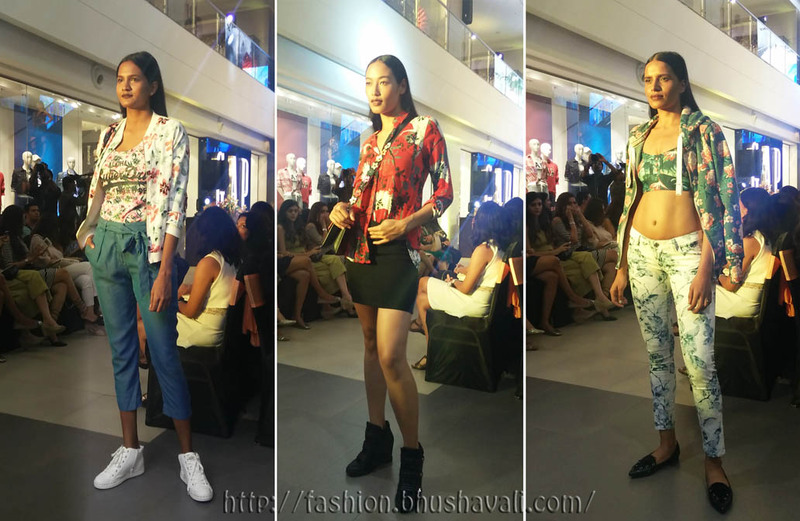 The next sequence was Florals and as the name suggests it was Floral printed clothing. There was a blue floral printed white denim. It did disturb me. I bought it a year back in London. A month back, when I went shopping again, to buy a similar denim, just before bidding adieu to London, I couldn't find it anywhere and I was told that's its gone out of trend. To see it here in upcoming trend was definitely weird for me!!! Well.. 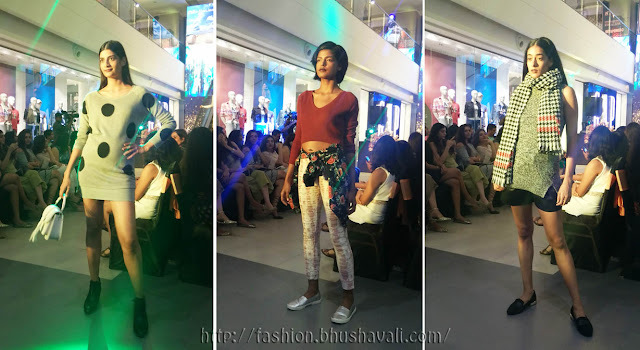 The age old concept that a fashion trend takes 6 months to come from New York / London to Delhi / Mumbai and 6 more months to come there to Chennai, probably still holds true!!!! The next sequence was Silhouette which concentrated more on the cuts than anything else. The next sequence of Dandy/Masculine outfits was also a bit similar to Silhouette but a bit more formal. 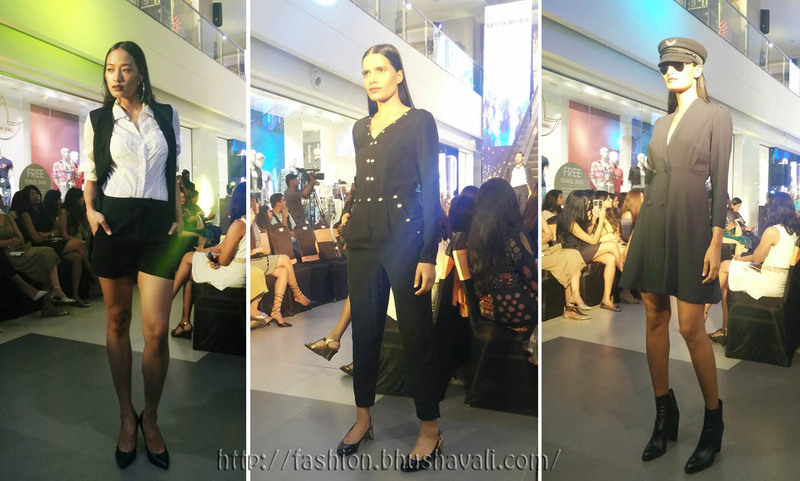 Apart from edgy silhouettes, this sequence also included a range of smart LBDs teamed with elegant swarovski jewelry. The Street Style sequence was perhaps the most playful collection of it all with the models walking in with skate board, basket ball etc! The last sequence was formals. One of the outfits definitely made me think of a cross between Sherlock Holmes & Pilot! The wrap up was with the spectacular show stopper, the 'Pink' girl, Tapsee Pannu wearing a Black velvet gown with a stunning neckpiece from Swarovski. Since the title sponsor was Cosmopolitan, its chief editor Nandhini Bhalla herself had come down to the show. Also here are the head of Phoenix Market City, Chennai Mr.Murugan Rajan and Lubna Adams. Btw reg my outfit, Cosmopolitan's Chief Editor Nandhini Bhalla herself said that my outfit was very interesting. So, what did I wear for the event? That's coming up soon in the next post. So what's your favourite sequence of these? And have you watched 'Pink'??? Very pretty model that Ms. Pannu. Hoping she goes international one day for all of us to see more of her talents. The clothes in this show look practical to wear. I like that the fashion show remains simple yet goes bolder with ideas and design. They all look perfect for their outfits. The fashion materials and the models have the responsibilities to perform their wares with flair. Dressing is a daily routine for some and it must be level-up overtime. Wow, they're all executed well during the show and they're really pretty. I have not gone through watching a show like this and I think it must be really fun and awesome. I was thinking where I saw this model and then realised she is "Pink" movie star. I am sure this would have been a great show. Star-studded! Tapasee, Lubna - so nice you could attend this fashion show. Wow! Awesome I love all the runway showcases. The design are unique and models are stunning. Wow, lovely outfits. I want to see a show like this, I dream of becoming a fashion designer.